The legendary food writer tells the poignant, personal story of her worldwide search for a Polish town’s lost culture and the daily bread that sustained it. A passion for bialys, those chewy crusty rolls with the toasted onion center, drew Mimi Sheraton to the Polish town of Bialystock to explore the history of this Jewish staple. Carefully wrapping, drying, and packing a dozen American bialys to ward off translation problems, she set off from New York in search of the people who invented this marvelous bread. Instead, she found a place of utter desolation, where turn of the century massacres, followed by the Holocaust, had reduced the number of Jewish residents there from fifty thousand to five. Sheraton became a woman with a mission, traveling to Israel, Paris, Austin, Phoenix, Buenos Aires, and New York’s Lower East Side to rescue the stories of the scattered Bialystokers. In a bittersweet mix of humor and pathos, she tells of their once vibrant culture and its cuisine, reviving the exiled memories of those who escaped to the corners of the earth with only their recollections, and one very important recipe, to cherish. 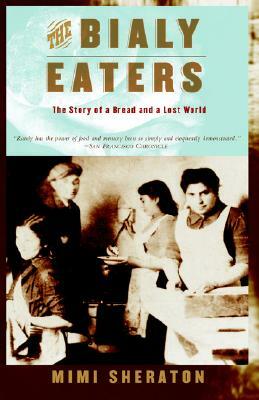 Like Proust’s madeleine, The Bialy Eaters transports readers to a lost world through its bakers’ most beloved, and humble, offering. A meaningful gift for any Jewish holiday, this tribute to the human spirit will also have as broad appeal as the bialy itself, delighting everyone who celebrates the astonishing endurance of the simplest traditions.